. It was a random purchase I made while wandering around Target and has turned into one the smartest random purchases I’ve ever made. I can’t even begin to tell you how much we have used this kitchen gadget over the years. 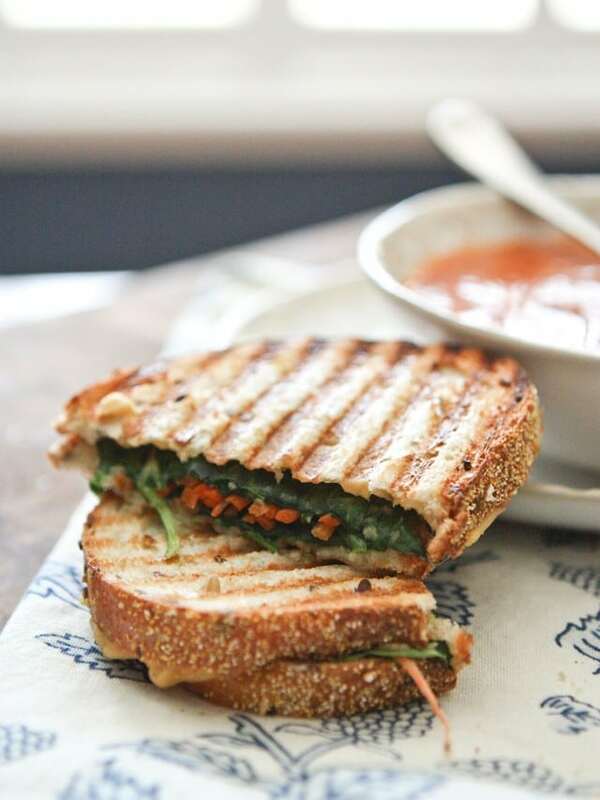 My kids are now obsessed with paninis and not only has my panini press saved me on many occasions where I had nothing but sandwiches planned for dinner but quick paninis have become a lunchtime staple during the summer months. Something about turning a simple turkey and cheese sandwich into a panini just makes things a bit more exciting I guess…and while everyone else is enjoying their lovely turkey and cheese paninis, I’m getting excited about this Hummus and Veggie Panini I am putting together for myself. This sandwich idea is obviously not very complicated. It came together with ingredients I pretty much always have in my fridge…hummus, spinach, carrots and cheese. If you don’t have matchstick carrots, a little grated carrot will work just fine. You can use any type of bread, but fresh whole grain bread from the bakery is my favorite. 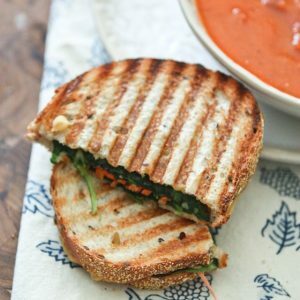 I served this Hummus and Veggie Panini with a bowl of Tomato and White Bean Soup and it was a perfect light meal for lunch or dinner. Preheat your panini press, grill pan or skillet. Build your sandwich by spreading hummus on one slice of bread, then spinach and carrots. Top with a slice of cheese then remaining slice of bread. 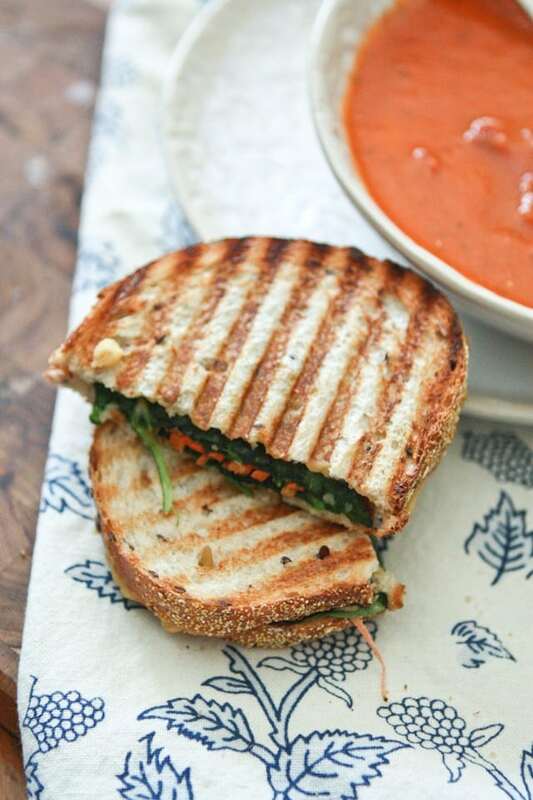 Place in your panini until cheese is melted and bread is toasted. If not using a panini press, make sure to use a heavy object (like another skillet with a large can placed in it) to press down your sandwich. You may want to flip over to evenly brown both sides (not needed if using a panini press, only if using grill pan or skillet). I mean seriously – why don’t I make paninis more often?!? Seriously!!! My kids ask for them ALL THE TIME. Yummmm. I think we have 2 panini makers and we never use them….This makes me want to pull them out! I adore hummus but always forget that I can use it as a condiment and not just dip Great sandwich! OK, I’m getting one of those presses. This looks amazing, Aggie. WANT for lunch today! I got a Panini Press about a month ago and love it. A veggie Panini sounds wonderful. This panini looks so delicious! I want one! OH okay. Yes. I’ve been needing new lunch ideas. All over it. This is exactly what I want for lunch today! Sounds so healthy and filling. Definitely the best looking panini I have seen. I have to make it! Ah, thank you so much for sharing this! Hummus doesn’t get enough attention as it’s not only delicious as a dip, but on sandwiches like yours and even on pizza. Yum! Your panini looks delish! Oh wow. That looks SO good! I love any type of panini.. but add some hummus in it and I am totally sold!